Another interesting article in the Conversation – Trolling our confirmation bias: one bite and we’re easily sucked in by Will Grant. It underlines a point I have often made – that the sensible reader must approach the scientific literature intelligently and critically. Grant describes a “scientific” prank which fooled many news outlets who reported the “scientific finding”, and, therefore, many readers. “To begin the study they recruited a tiny sample of 15 people willing to go on a diet for three weeks. They divided the sample into three groups: one followed a low carbohydrate diet; another followed that diet but also got a 42 gram bar of chocolate every day; and finally the control group were asked to make no changes to their regular diet. “The key, Bohannon stated, was to “exploit journalists’ incredible laziness” – to write the press release so that reporters had the story laid out on a plate for them, as it were. As he later wrote, he “felt a queazy mixture of pride and disgust as our lure zinged out into the world”. And a great many swallowed it whole. and we’ve got us: simple creatures prone to click, read and share the things that appeal to our already existing biases and baser selves. Bohannon gives his prank as an example of a “diet research-media complex . . that’s almost rotten to the core.” I agree readers should be far more sceptical of such diet-related science stories. But the problem is far wider than that industry. I think is particularly relevant to any area where people are ideologically motivated, or their feelings of inadequacy or danger, can be manipulated. Take, for example, the anti-fluoride movement. I have given many examples on this blog of science being misrepresented, or poor quality science being published and promoted by this movement. There are examples of anti-fluoride scientists doing poor quality research – often relying on “statistical fairy tales. Examples of using shonky journals to get poor quality work published. But also examples of such work making its way through inadequate journal peer-review processes. These anti-fluoride researchers, and their allied activist groups, commonly use press releases to promote their shonky findings. Social media like Facebook and Twitter are roped in to spread the message even more widely. There is also a link with big business interests – in this case an active anti-fluoride “natural” health business-research-media complex. So readers beware – there are people, businesses and ideological interests out there attempting to fool you. And they are not averse to using shonky or false science, biased press releases and lazy journalists to do this. 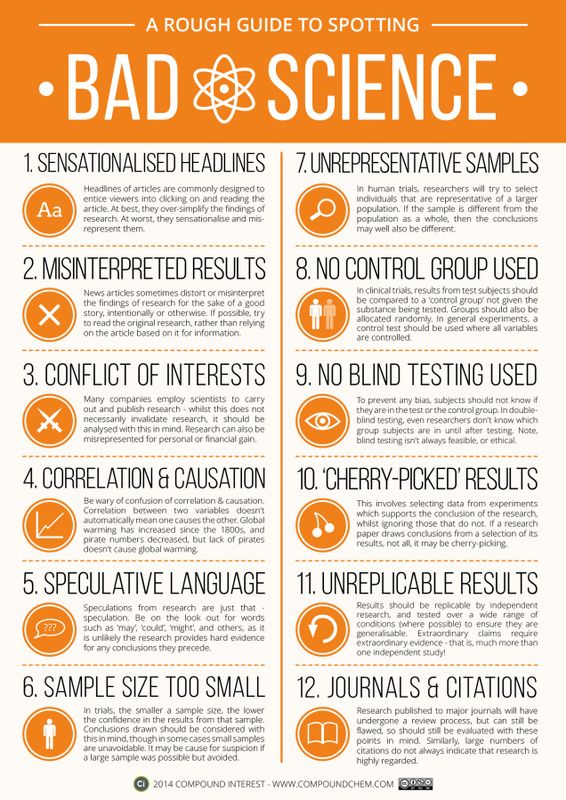 See also: A rough guide to spotting bad science from Compound Interest (Click to enlarge). Great post Ken (& I did check the links to the blog posts 🙂 ).